Like nails embedded into building’s frame, window sills are a necessary building material needed for installing windows. It is the door to a doorframe, the steps to the porch and roof to a dwelling. It is an expense that usually doesn’t break the pocketbook if one chooses to use standard material. Here’s the thing about standard—it’s just that! Installing standard building materials will certainly be respected and appreciated, but the chances of getting the ‘wow’ factor out of clients and having it look as though it could be featured in a publication are slim. For builders and contractors who are looking to get more business, they are going to need people to talk about them. Sure, thousands of dollars can be put toward marketing and advertising and yes, one can expect to see results if enough time and money is invested into such endeavors. However, some have said that the best kind of advertising is word of mouth. How do you get that? By providing a product that impresses clients so much, that they feel that they have to talk about it, and by talking about the product, they are talking about you and your business. See how that works? What’s the Big Deal about Window Sills Anyway? A window sill is the lowest part of a window frame that works as a ledge. It is designed to support the window to keep it from swaying or wiggling out of place. A window is just a big hole in a structure. Without proper support within that window, it can buckle compromising the entire dwelling. By simply placing a window sill at the bottom of this ‘hole,’ otherwise known as a window, it is now bracing it, keeping it secure. Another big deal about window sills is that they keep water out of a structure. They are typically installed at a slant so when the water rolls off the roof, it can also roll off the window sill and away from the structure. In earlier builds, stone was the primary building material. Stone dwellings can be found in the Eastern part of the world serving as an example to its durability. As the population increased and what could be considered thousands of years ago as ‘new development’ spread throughout the land, stone became less convenient because it was too heavy to carry. Early settlers found wood as an easier resource to harvest and it was much lighter than stone and served multiple uses, not to mention it cost less. One didn’t have to trade as much resources for wood. Wood is still used for window sills and is considered the standard material for most builds. However, wood window sills have its drawbacks. Wood comes from trees and trees are basically big plants. True, wood is a strong material because it comes from a strong and sturdy plant. Yet, what happens when a plant is no longer embedded in the soil? It dies. So wood can be looked at as a dead plant. Therefore, wood needs to be treated in order to be an effective building material. However, even treated wood will eventually rot and decay after an excessive amount of exposure to the elements. As a result, it will need to be replaced. Marble window sills are water-resistant and in most cases will never need replacing unless there’s some sort of act of nature like an earthquake or tornado that could destroy an entire structure altogether. Other than that, marble is one of the most durable building materials that can be used. It won’t scratch or score so you don’t have to worry about anyone leaving watermarks or carving any initials into it. Marble comes in a wide array of various earth-toned patterns that are guaranteed to complement any window dressing. Because of its remarkable beauty, designers have gotten creative and began using marble window sills for different uses. Window sills are basically small shelves to a window. When one looks at window sills as a shelf—a marble shelf, the possibilities on how to incorporate this material into a space widens. For instance, window sills of all kinds, including marble are manufactured in certain sizes as most builds require windows to be. Simply by widening the width of a marble windowsill turns it into an eye-catching shelving unit. One way to out-shine the competition is to offer the best type of window sill available on the market. The way to do this is to research the highest priced marble materials. 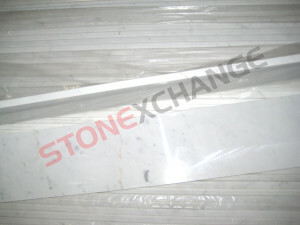 Stonexchange is a marble windowsill and threshold manufacturer and distributor located in Miami, Florida. We have an abundant supply of marble window sills as well as other materials in stock and are available to ship your window sills out upon order. As a wholesale distributor, we offer discount prices with bulk orders. View our online catalog for the many different styles you can order. If you are ready to put the ‘wow’ factor in your next building project and get people to start talking about your work, contact Stonexchange today. If you have any questions about our marble window sills, thresholds, or soap shelves, send us a question online or call us today at 305-731-2400.